I have done something similar with my keys...in the door overnight. I can certainly relate to that one! I hope Mr. Ski gets better soon. The flu is lousy. Oh no... I did the key thing just today! I had to run back into a store really quickly when I realized I didn't have the right item. I didn't even notice my keys were missing and that I had forgotten to lock the truck (with my purse sitting on the front seat) until I got back to the truck and didn't have to unlock it... then realized that my keys were still in the ignition. I'd never done that before - I felt like my brain had just taken a vacation... without me. Zicam IS gross. It leaves a nasty feeling in your mouth. Have fun on your trip. Oh and I'll trade you that giant slug for a GIGANTIC hoot owl that could claw your eyeballs out. Deal? I guess more people than I realized have similar issues with keeping up with keys! It makes me feel better and more normal! haha! Thanks for all the comments ladies...I really hope that the weekend with my mom is as good as I'm hoping it will be! And Tiffany...Zicam is disgusting and THANK YOU for agreeing with me! And No Deal on the hoot owl...I'll stick with the slug that doesn't have talons! Gosh, I love the word talons it reminds me of Napoleon Dynamite! That slug is so gross. LOL. Way too big. I can't eat Taco Bell. It makes me ill everytime. Then again, I can't eat most fast food. When we want fast food we usually get a sub somewhere or Tace Bueno. Enjoy the visit with your parents!! Walked out onto my porch the other night to convince the wieners it was time to come in. Damn near did a complete flip when I stepped on a mutant sized slug!! Scary about the keys outside and potential for disaster - I'm glad to hear nothing happened though and that a lesson was learned :) Hey, I'm famous for leaving my keys IN the lock - but I live in a condo and someone will usually knock and hand them over with a shake of the head, lol. I love the picture in your header, so romantic, pure...sigh. As opposed to that ugh, slug LOL! I left the door unlocked yesterday morning as we were rushing the kids to soccer...got home and of course blamed the husband. After all, he was the one with the key (never mind that I was the last one out the door and forgot to mention that he had to lock it :). Glad he loves me. 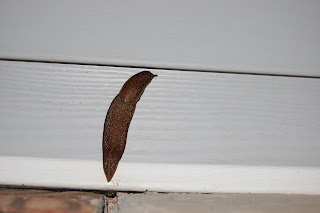 That is just one Nasty slug (I had to capitalize because of size). They gross me out.